There were two major Swedish tests made during fall 2012. Råd & Rön and Testfakta. The former is issued by Sweden’s leading consumer organisation, Sveriges Konsumenter, and the latter is a privately owned consumer testing company supplying independent testing of consumer products for major newspapers in Scandinavia. The quality is more varying among the fluorescent lamps than in LEDs. Our test shows that there are many bad CFLs. Durability is a sensitive subject. Sure, only some lamps had gone out after 2000 hours. (We tested five samples of each lamp.) But many of the poorer quality fluorescent bulbs cannot withstand many on-and-off cycles. Philips Softone 20W can handle just a little over 5 000 on-and-off cycles. Manufacturers indicate lifetimes of 6 000 to 12 000 hours, resulting in a life expectancy of 10 years. This is hardly true for the worst lamps in the test. Sylvania Mini-Lynx Fast Start is a really bad lamp. As all lamps had gone out before 2 000 hours, we could not do the remaining tests. The fluorescent lamps have been on the market for a long time. Many have complained that they take time before reaching full brightness, and this is still the case. This is particularly true in low temperatures. There is a clear disadvantage if you want them in outdoor lighting, or for example in bathrooms and closets where you are anxious to reach full brightness quickly. Philips Softone Candle 8W for example, reached only 2 percent of its light output after 10 seconds when it was lit at plus 5 degrees and 1 percent of its light output at minus 10 degrees [Celcius]. The fluorescent lamps have also consistently slightly worse color accuracy than the old bulbs. Well, lo and behold! This is the first time Råd & Rön have totally dissed the precious CFLs, even though these problems have been found in every one of their previous tests, and usually a lot worse too – as CFL quality has improved slightly over the last few years compared with the really really bad earlier specimens – which previous Råd & Rön articles have still insisted were mostly great, despite their own test results showing a different story. So why this sudden change of tune? Ah, because now there is a new, even more politically correct lamp on the market, which makes manufacturers even more billions. From September 1st 2012, incandescent bulbs are no longer manufactured in the EU. They are very inefficient, only 10 percent of the energy becomes light, the rest is heat. They have been phased over several years and now the last models are gone. Interesting that a supposedly independent and neutral consumer test article feels a need to insert the PR line about the alleged – but disproven – energy inefficiency of the now banned incandescent lamp. They don’t seem to realise that this is the equivalent of adding that one of the soda pops in a test “gives you wings” or “because your’re worth it!” when testing face creams. Now even the LED are entering the market in a big way. They are even more durable and efficient than the fluorescent lamps. Previously, there has not really been models adapted for the fixtures we have in our homes. LEDs have also been very expensive. Now, there are LED lamps in a form that fits into standard fixtures. 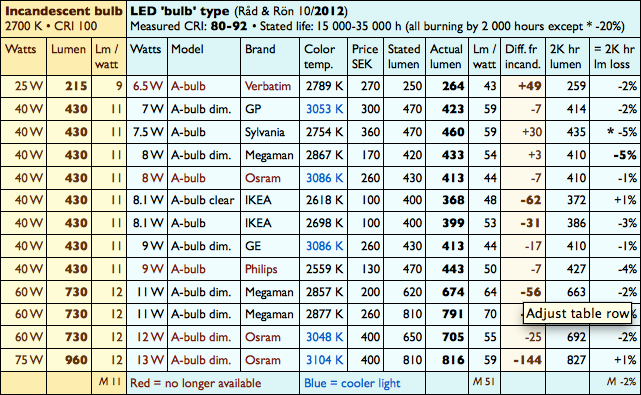 The prices are also coming down, LED – lights in our test cost from SEK 400 down to 100 each. LEDs are incredibly durable. We have in this test so far let them burn for 2000 hours, and only one copy of all the lights (we tested five samples of each lamp) went out during that time. Since previous tests, we know that LED bulbs can burn longer than that, 5,000 hours. We will let them burn as long this time and will be back with updates of the results. Manufacturers usually specify lifetimes for LED lamps of 15 000 – 25 000 hours, that is, a life expectancy of 15-25 years. There are values ​​that we obviously have not been able to verify. So, how can Råd & Rön state as a fact that they are “incredibly durable”? Sounds more like a “probably the best lamp in the world” slogan to me. And why not actually test them for the full stated life? Or at least half? Then we would see how little light comes out of them by then, and how durable they really are. LEDs are also very effective. They consume less energy than fluorescent lamps and much less than halogen lamps. Not to mention the old incandescent light bulbs – an LED bulb uses 80 percent less energy than an old bulb. For this to be true, they would have to give 5 times more light per lumen than an incandescent, and consistently over time. From their own numbers I get a mean of 4.6 initially and this will decrease over time. Taking the heat replacement effect into account, this number should be cut in half. IKEA, Philips and other lamp producers often claim as much as 85% more effective to make it sound more worthwhile buying these hilariously expensive lamps instead of the CFLs that have now become less profitable. LEDs provide plenty of light as soon as you turn the switch, unlike fluorescent lamps. Another advantage is that LED lamps also work well at cold temperatures, the lamps actually work even better then. And even at cold temperatures, the tested bulbs light up immediately. Suitable for outdoor lighting in other words. Well, not all of them: the Verbatim lamp took longer to light up, according to test data. But yes, LEDs are often a better choice for outdoor fixtures than CFLs in countries with cold winters. One disadvantage is that the LEDs can have a well cold, almost bluish white light. They also reproduces colors slightly worse than halogen and incandescent bulbs. But technology advances and the number of lights in the test have received a warmer light, and also a better color reproduction. Osram LED Parathom ClasA60, Ikea Conductors 8, 1W and Philips Led MyVision have received the best results for color among LEDs. Yes, they are getting better. But they will still never be able to reach the same light quality as incandescent and halogen incandescent lamps because the light is still a composite light, from a mixture of phosphors trying to emulate the real thing. If in doubt, ask to see how the LED lights in the store before you buy it. This piece of advice is only partially helpful since the store is not dark. It helps you weed out the clearly blue-white, green-white or violet-white lamps. But as can be seen in my previous LED reviews, a warm-white lamp can look great in the shop. But then when you switch it on at home you’ll find that the colour is a bit off, that it produces a duller ambiance and generally doesn’t feel as good as more natural light sources such as sunlight and incandescent lamps. I will also add a copy to the Consumer Tests LED page to keep them all together. Halogen lamps, on the other hand, have good colour properties. They reproduce colors accurately, just like the old bulbs did. They are also considerably less expensive than both LED lamps and fluorescent lamps, and cost SEK 15-30 each. But they are far less energy efficient and have a shorter lifespan. Ikea 70W Halogen was the only lamp in our tests where all samples still burned after 2000 hours. This means a life of about two years and more promises nor manufacturers. 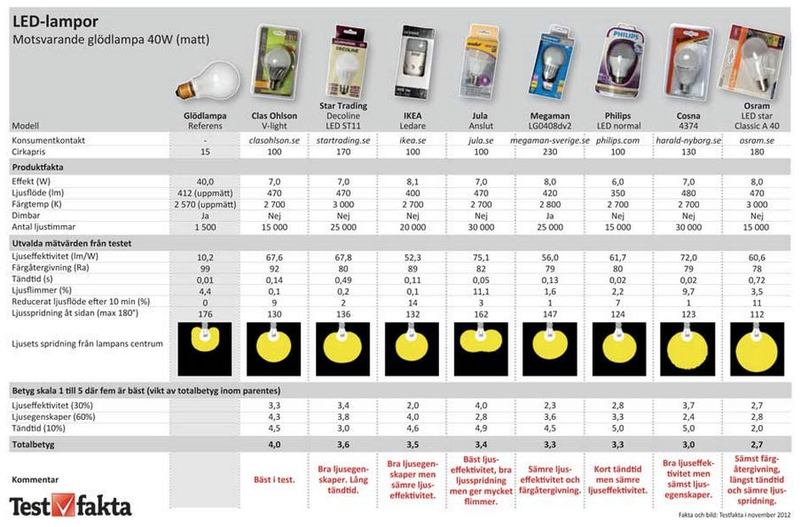 The table actually shows quite poor results for all the tested halogen lamps. All top quality when it comes to colour rendition and light quality, of course – except one IKEA lamp which also had a higher colour temperature, so they must have done something to it. But quantity-wise, these halogen energy savers appear only marginally more effective than the original equivalent incandescent lamps. When this happens year after year, despite the fact that it is quite possible to produce halogen lamps with both higher efficacy and durability, I’m starting to suspect that this is by design so as to help these last incandescent-family low-profit lamps out of the market when up for review by the EU Commission in 2014. This is not acceptable! Testfakta have investigated eight omnidirectional LED bulbs and compared them with their glowing predecessor. The lamps test correspond to about a 40-watt incandescent bulb in brightness and color temperature. – One major difference lies in how LEDs spread the light. But what surprised me most was the time it took to light a couple of lamps, and some gave excessive flicker, says Håkan Skoogh, test manager at the Swedish Technical Research Testing. Together with fluorescent lamps, LED technology is the incandescent-replacing alternative that provides the greatest energy savings. The Testfakta test also shows that LEDs provide between five and seven times as much light per watt as incandescent lamp. While it differs as much as 30 percent between the most efficient lamp from Jula and the least efficient from Ikea. – In this context, Ikea’s energy efficiency is on the low side. On the other hand, it has the good color rendering and these things usually go together – if you want good color, you often get poorer efficiency, says Håkan Skoogh. But it is possible to have both high efficiency and high color rendering. It shows the overall test winner V-Light from Clas Ohlson, which is also among the least expensive lamps in the test. V-Light is the only lamp that comes close to the incandescent bulb’s ability to reproduce colors. Osram, Megaman and Cosna on the other hand, fall just below the limit of what is recommended for home environments. – Unfortunately, this is a problem that we have to live with for a while in terms of LED technology. If you want the perfect color in the bathroom or above the hall mirror, for example, to see how the clothes match, you may unfortunately put up a halogen lamp instead, says Håkan Skoogh. Another challenge for the LED industry is that the light from small LEDs is so directional. It is ideal for spotlights, but worse when you want to replace the incandescent bulb’s omni-directional effect. Laboratory measurements clearly show how most of the LEDs spread the light at an angle forward and not so much to the sides. – If you have for example a decorative lamp with a side shade, then you want some of the light to come through it. But with lamps such as the Osram lamp, a large part of the light rather goes straight up to the ceiling. The exception among the tested lamps is Connect from Jula. Here, the manufacturer uses another technology with a light guide that leads the light from the diodes and outward. – It works quite well even if the light ahead will be somewhat weaker than in the bulb, says Håkan Skoogh. There may also be advantages to different types of light scattering. Forward-facing light is preferable, for example, a desk lamp. – It would be best if the producers had a light distribution curve on the package so that you as a consumer can see which bulb fits best. The laboratory also examined how much flicker the lamps produce. Research suggests that flicker from screens and lamps can have adverse medical effects such as fatigue and stress. It was found that the lamps from Jula and Cosna flickered unnecessarily much. – It shows very clearly and is not good. Flicker has primarily been a problem in old fluorescent and should not be in the LED lights. It must be about poor construction, says Håkan Skoogh. Another thing that should not have to occur with LED technology is long ignition times. And yet the lamps from Osram and Star Trading clearly react slower later the rest. – It is unnecessary and distracting, says Håkan Skoogh.